RANK function returns the rank of a value in a group of values. It is very similar to DENSE_RANK function. The rank function can cause non-consecutive rankings if the tested values are the same. Whereas, the DENSE_RANK function will always result in consecutive rankings. The RANK function can be used two ways – as an Aggregate function or as an Analytic function. As an Aggregate function, the RANK function returns the rank of a row within a group of rows. expression1 .. expression_n can be one or more expressions which identify a unique row in the group. Note: There must be the same number of expressions in the first expression list as there is in the ORDER BY clause. The expression lists match by position so the data types must be compatible between the expressions in the first expression list as in the ORDER BY clause. The SQL statement above would return the rank of an employee with a salary of $10,000 and a commision of $200 from within the employees table. Here RANK function returns the rank of each row of a query with respective to the other rows. 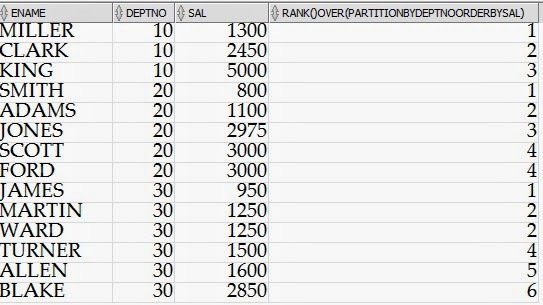 The SQL statement above would return all employees and calculate a rank for each unique salary in all department. If two employees had the same salary, the RANK function would return the same rank for both employees like shown in below query results. However, this will cause a gap in the ranks (ie: non-consecutive ranks). This is different from the DENSE_RANK function which generates consecutive rankings.